Continuing with our series on the Costliest Rulings in Golf, here is yet an another event that can be tagged “a misfortune” in golfing history. In case if you missed our previous post on this series click here. It was 1987 and Craig Stadler (nicknamed “The Walrus”), who was among the third-round leaders, hit his tee shot on the par-4 384 yard 14th hole at the San Diego Open at Torrey Pines. Unfortunately, the ball landed under a low-hanging branch of a large Leyland Cypress tree. To make his swing easier, Statdler decided to hit his next shot from his knees. In order to do that without staining his expensive pants from the wet grass, he placed a towel under his knees and chipped the shot into the fairway. Little did he knew about the consequences of that. 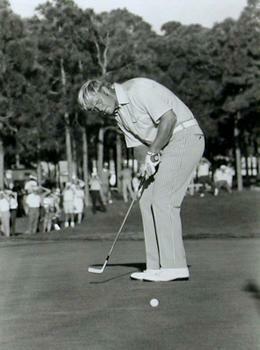 When the 3rd round highlights were televised in NBC before the Sunday’s final round, the scenes of Stadler kneeling to his shot caught the attention of many viewers. Viewers then flooded the tournament press with phone calls saying it was a violation of PGA rule. He finished his rounds 4 shots behind George Burns but was later informed by the officials that use of the towel was considered “building” a stance, which is a rules violation. And because he had signed the scorecard for less than the correct score (i.e without two-stroke penalty) on Saturday, he was disqualified from the tournament. It costed him $37,000 prize money and second place. 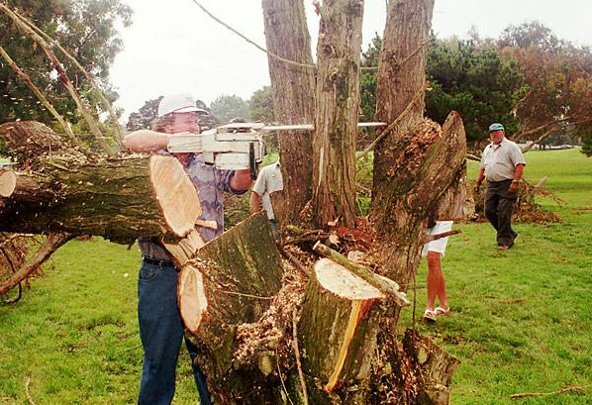 8 years later when Tom Wilson, a member of the tournament organizing committee, heard the tree was dying by fungus, invited Statdler to do the honours and help cut down. Statdler readily accepted and said “It’s been eight years. It’s time to put it rest”.